Openness is at the core of this project and allows for participants not only to help create the structure of Open Engagement, but to input various meanings and create numerous experiences. Since 2007, Open Engagement has become a vital international site for the support and development of socially engaged art. Open Engagement (OE) creates a platform that explores and supports the work of transdisciplinary artists, activists, students, scholars, community members, and organizations. It convenes presenters and attendees from around the world to share current perspectives and approaches to this work. It also brings together museum professionals and MFA programs working in social and public engagement—making it a key meeting point for development and knowledge sharing in these areas. OE has also included ongoing dialogues that are associated with but not exclusive to the conference—blog projects, partnerships, and the newly formed publishing arm, OE in Print. The conference mission is to expand the dialogue around socially engaged art, as well as the structures and networks of support for artists working within the complex social issues and struggles of our time. This free conference is an essential educational resource that delivers content that provides attendees with skills and tools that support their work in communities and embedded contexts. Open Engagement is a site that expands to define the contours of socially engaged art making, serving as a site of production, as well as reflection. Now seven years into its evolution, Open Engagement is in a critical moment of development. The conference has grown significantly each year, widening its scope and reach, as well as serving as an important site of development and education around socially engaged art in the United States. OE is the only conference on this subject of this scale that operates on an inclusive open call model that supports diverse publics as well as emerging and established artists. Open Engagement started in 2007 in Saskatchewan, Canada, and from 2010-2013 was held in Portland, OR. The 2014 move of Open Engagement to the Queens Museum in New York marked its beginning as an itinerant conference working to build national partnerships from coast to coast, which will galvanize and strengthen the networks of support for socially engaged art. 2014 also marked the beginning of an important partnership between Open Engagement and A Blade of Grass in New York. The missions of both organizations work together to further their mutual goals of providing resources to artists who demonstrate artistic excellence and serve as innovative conduits for social change. 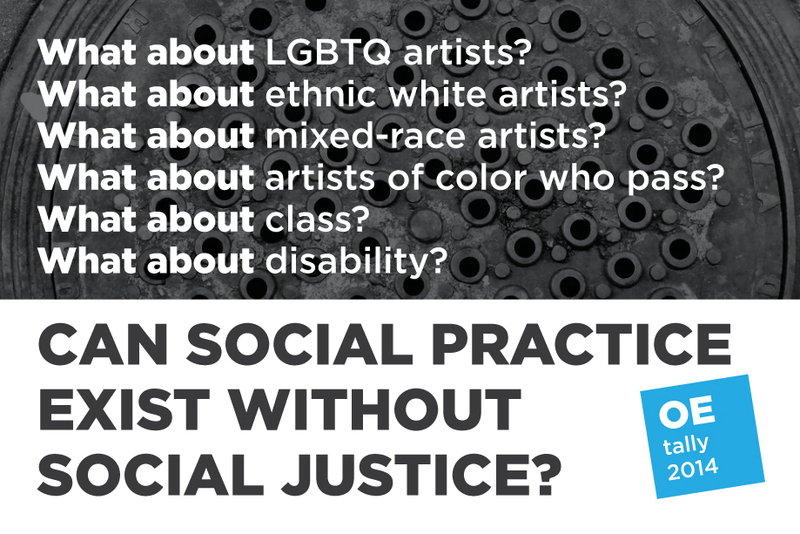 Together we seek to foster a program that pushes these practices further and promotes this way of artists working in the world. OE helps promotes the growth of the field and supports contributors by offering a space for continued development, education, and connection. In order to achieve a coast-to-coast representation of socially engaged art practices in this country Open Engagement is building a national consortium and will have landing points on the West Coast, Midwest, and East Coast. Starting in 2016, OE Conferences will cycle through three landing points of socially engaged art activity: the Bay Area, Chicago and New York City. The three-year annual rotation cycle will begin with the Bay Area in 2016 in partnership with the Oakland Museum of California and the California College of the Arts, Chicago in 2017 in partnership with University Illinois Chicago’s Art and Social Justice Cluster, and returning back to New York at the Queens Museum in 2018. Expanding this national conversation will ensure that OE is a site that more holistically represents and supports current work and practices in this country. This text will look at the origins of the conference and reflect on the past six years of Open Engagement. We hope that this information will give insight into the conference as it continues to grow and evolve. Open Engagement began as a student project. Open Engagement: Art After Aesthetic Distance was the first iteration of the conference and began as a hybrid project that used a conference on socially engaged art practices as its foundation and incorporated elements including workshops, exhibitions, residencies, pedagogy, curatorial practice, and collaborations. The goal was to foster a different kind of conference—one that worked with a sense of togetherness. The conference, from its inception, puts emerging and established voices side by side, and highlights different ways of knowing and learning. It remains a conference that is free and programmed through an open call for submissions. In relation to OE from 2007-2013 this free site of knowledge was hosted primarily by universities. Funds were redistributed in order to create an institutionally supported site of public knowledge sharing. The conference being free emphasizes a different kind of exchange—OE is a hub for the transmission of knowledge and space to the further support artists working in these ways. It is important to keep the perspective that Open Engagement, while it stems from an artistic practice, is ultimately a conference. The standard practice of a conference is that presenters and attendees pay fees to attend and participate as a speaker. At the annual College Art Association conference, for example, non- members pay upwards of $685 to attend the three day conference, with students paying up to $185 to attend the event. Even as a presenter sharing your work, you are expected to pay to attend. There is a good reason why other conferences cost so much to participate in—these are expensive events to put on. Despite the high cost of putting on a conference year after year, it has been a core tenet of Open Engagement to remain free to presenters and attendees. While the transition to a mobile conference that travels between three locations in the country promotes further accessibility, the sustainability of the feasibility of the conference remaining free is in question. We are able to keep the conference free thanks to the generous support of our partners. We believe that maintaining this position is a way to promote access and inclusion. Open Engagement, through open calls and expansive and inclusive working methods, evaluates the work in this evolving field by fostering diverse and practical discourses about the aesthetics, functions, ethics and meanings of socially engaged art that resonates within and outside the contemporary art dialogue. Year after year a rotation of committees are brought together to assess the applications from the open call for submissions and through collective decision making program the conference. The committees are made up of individuals representing a wide breadth of diversity not only in ethnicity and gender—but in ideas, experiences, and backgrounds. 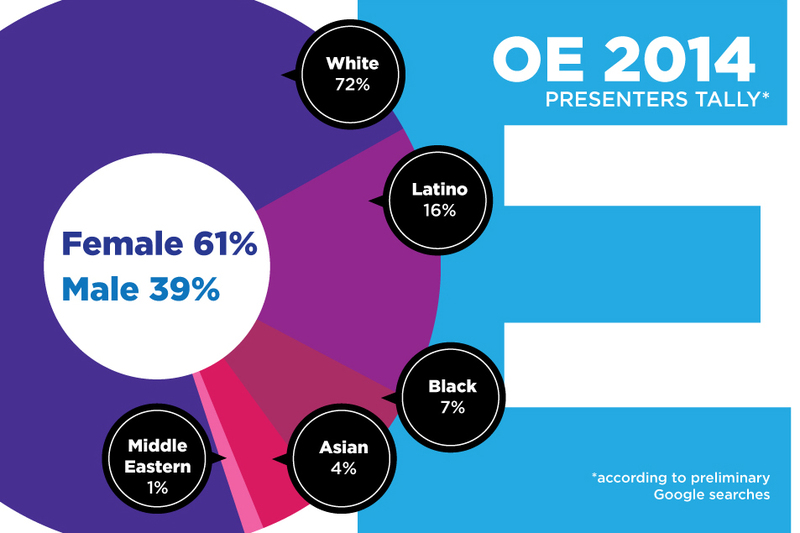 In 2014, the Michelada Think Tank issued a guerrilla tally of the diversity of the OE presenters. Their research was conducted through Google searches of the presenter names listed on the preliminary OE schedule posted on the OE website. This year, in response to the tally, OE (using the same approach as the Think Tank) assessed both the diversity of the pool of almost 400 applicants, as well as the tally of the 207 accepted presenters. In the future OE would like to have the option for presenters to self-identify if they choose, and respond to questions that could help address the questions put forth by the Michelada Think Tank. The data collected from the applicant pool almost exactly matches the statistics put forward by BFAMFAPhD of the diversity of recent art school graduates. This correlation should come as no surprise since a large majority of presenters at OE are practicing artists. But taking stock of who is present and who feels included is only the first step in this process. As Maya Wiley, Counsel to the Mayor De Blasio has said on diversity in the arts, “It’s not a quota system, it’s a conversation.” Open Engagement wants to ensure that there are a multitude of insights and perspectives included in that conversation. This year the Michelada Think Tank has been accepted to create an ongoing space at the conference that will address some of these issues and offer tools and resources. It is these kinds of productive relationships that move toward positive change and action instead of being mired in the histories, antagonism, and stagnation of Institutional Critique. OE is not a site that needs decolonizing (as a recent conference proposal suggested), we are a site that needs supportive allies—people to work along side us to change these larger systemic and institutional inequities. We typically receive close to 400 proposals from around the world each year. Relevance: Connection to the submission category as well as the relevance of the application to the landscape of current social/public art practices. Audience Value: How does the submission serve the publics that will be gathered for the conference? How many people will be able to participate? There should be a mix of presentations and projects included that will address both large and intimate audiences. Once the submissions are ranked, the committees narrow down the top selections to fit within the time reality of three-day conference—about 22 hours of total program time. We have a very small OE core staff (2.5 people) that handle and support all the selected presenters and handle all communications. Most years the conference accepts over 120 presenters. This year we have accepted over 200. While these logistics are the reality we are continuing to figure out ways to include more voices, be flexible, and allow for the conference itself, and all assembled, to push forward the content and shape of the event in different ways. This year at the conference there will be several spaces throughout the conference that are more emergent zones for sharing work and shaping conversations as the conference goes on. One such space will be a dedicated room for an “unconference” to take shape should attendees decide to activate it. Another constraint is of course physical capacity. It is clear that there are many people who want to participate in these conversations at the conference. Last year we had to make a decision to limit the registration of the conference attendees to 1200, which we met. #Closedengagement came to the surface again as people felt shutout. This was an unfortunate impact of the reality of capacity and comfort issues. When OE participation exceeded capacity in the past, the result was people sitting on floors and the last-minute need to set up overflow rooms. This is not a situation we want to repeat, and instead work in advance to find large enough venues to host the potential demand. Many people do a great service in making Open Engagement a reality. Open Engagement receives criticism every year from people upset about their lack of inclusion, or their desire to see certain ideas and themes more fully represented. In many ways OE is a “do-ocracy”, a small group has organized to make this space and open it up for use. Since OE is a D.I.Y/D.I.T endeavor I want to encourage people to take it upon themselves to also create platforms such as these and put in the work to make these come into being. This could be organizing your own convening, or utilizing the space that OE provides for emergent programming to take place. Open Engagement is a crucial meeting point for the dialogue surrounding socially engaged art practice, as well as a generative site of production. It expands to hold these conversations, support these practices, and strives to fully explore the contours of these ways of working in the world. We want to continue to be a key site for the conversations and issues. We want to continue to grow alongside the field and work to support the continued evolution of socially engaged art by offering a site for continued development, education, connection, and experimentation. As the structure of the conference evolves we want to hear from you on how OE can provide an inclusive site, and service for these practices moving forward. This piece is a part of a long-form ‘social response’ to the Open Engagement conference. Please read the full series here. Jen Delos Reyes is a creative laborer, educator, writer, and radical community arts organizer. She is the director and founder of Open Engagement, an international annual conference on socially engaged art and is currently working on I’m Going to Live the Life I Sing About in My Song: How Artists Make and Live Lives of Meaning, a book exploring the artist impetus toward art and everyday life.